Within the past month I've seen more violence then I would hope to see in a lifetime. Growing up I was taught to be kind to everyone no matter who they were. I never understood why one human would hate another human just because of what they looked like, or their religion, or their sexual orientation....To be honest I still do not understand. The amount of senseless murders I have seen in the past month has not only scared me but has made me angry. 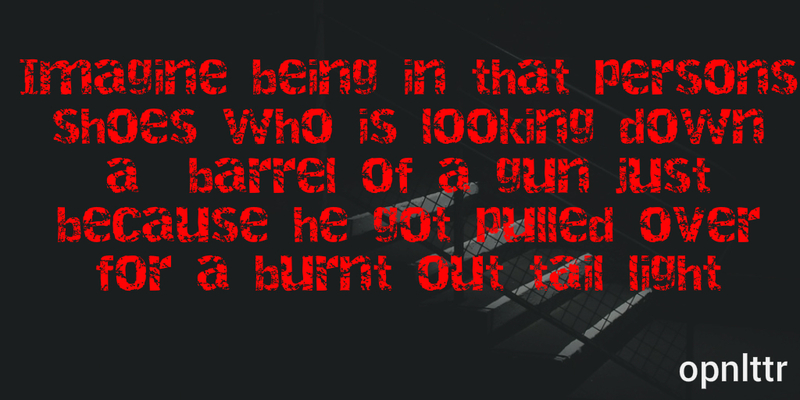 Imagine being in that persons shoes who is looking down a barrel of a gun just because he got pulled over for a burnt out tail light. Or all of the men and women who thought going out to a bar would be fun that night. I am a straight white girl, I am not a part of the handful of groups being targeted lately. No I do not understand the pain and suffering you are going through. No I do not know what it is like to feel hunted. However I do know what it is like to feel helpless. Please I ask you to fight back at these people but do not use violence. Stand up for what you believe in but do not use violence. Be the bigger person but do not use violence. Violence is not the answer and it never will be.